Set in 1800 in Britain, Mad King George is on the throne with Napoleon Bonaparte knocking on the door. Unregistered magic users are pursued to the death, while in every genteel home resides uncomplaining rowankind bondservants who have become so commonplace that no one can recall where they came from.Meanwhile, Rossalinde Tremayne is satisfied with her life as a cross-dresSet in 1800 in Britain, Mad King George is on the throne with Napoleon Bonaparte knocking on the door. Unregistered magic users are pursued to the death, while in every genteel home resides uncomplaining rowankind bondservants who have become so commonplace that no one can recall where they came from.Meanwhile, Rossalinde Tremayne is satisfied with her life as a cross-dressing privateer captain on the high seas. But a bitter deathbed visit to her estranged mother changes her life completely when she inherits a magical winterwood box. 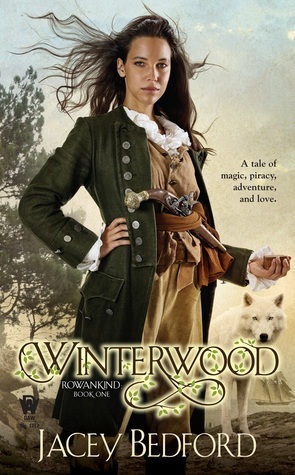 Now, not only is she confronted with a newly-discovered brother, and an annoyingly handsome wolf shapeshifter, Rossalinde has to decide whether or not to open the box to free rowankind and right an ancient wrong—even if it brings the downfall of Britain.This brand-new series is perfect for fans of Elizabeth Bear, D.B. Jackson, and Marie Brennan, as well as readers of historical fiction who are looking for an accessible gateway to fantasy.